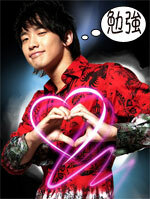 Bi (Rain) is a popular Korean singer/actor. Since he has gained a good bit of popularity in Japan, many of his his songs also have versions where he sings the lyrics in Japanese, as well as Japan-only releases. Though his name is written "Bi", Korean pronounciation dictates it as being pronounced more like "Pi", when referring to the Japanese system of romanization.